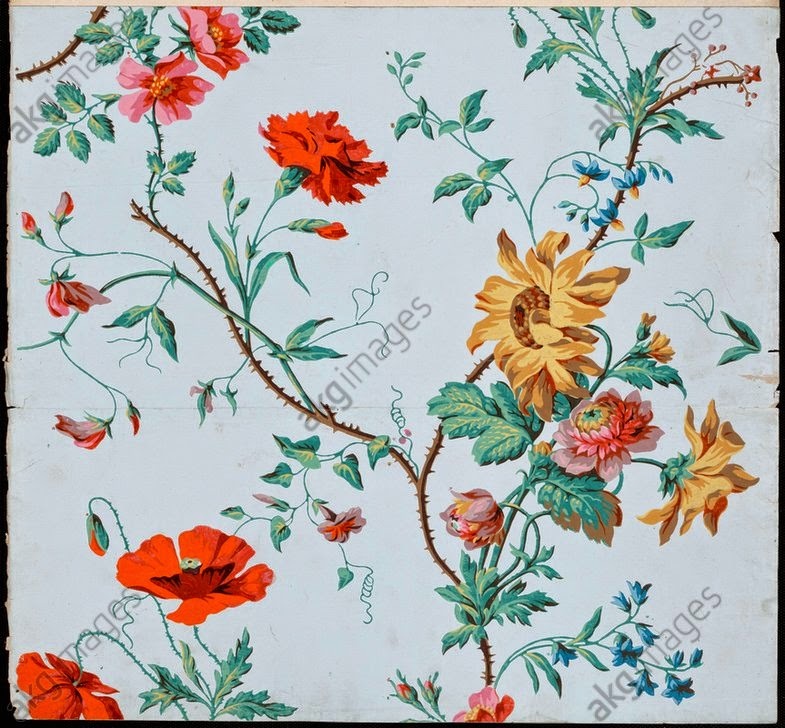 From the 1760s, France took over from England as leader in the production of luxury wallpapers. As well as the flocks, French manufacturers perfected the art of creating elaborately decorated papiers peints, based on the technique of block printing using water-based distemper colours to create a deep and uniform finish. Jean-Michel Papillon described the new technique in 1766 – “all distemper and absolutely matt like stage scenery” - and it was definitively established by the 1770s. Wallpaper production continued to flourish throughout the Revolutionary period and into the mid-nineteenth century . The business of Jean-Baptiste Réveillon, and his successors Jacquemart and Bénard, is the most famous and best-documented, but there were many others. The Almanach de Paris for 1788 listed 48 "papetiers en meubles", ranging from a couple of employees to Réveillon’s 350 workers. By 1795 the firm of Robert & Cie, which is virtually unknown, had exceeded Réveillon’s enterprise in size and employed 400 people. The industry was concentrated in Paris, in the rue Saint-Jacques and later the Faubourg Saint-Antoine, and in Lyons, the capital of silk weaving – where again it is ill-documented. The availability of specialist designers and a skilled work force were an obvious attraction in these centres. The one exception was Jean Zuber who set up in 1792 at Rixheim, near Mulhouse in Alsace, though here too there were close ties with the local textile industry. It is clear that competition for novelty and fine design was intense – the Musée des Arts Décoratifs has pattern books of Réveillon's dating from 1770, 1771 and 1772, representing no less than 61 different wallpapers, both flocks and distemper block prints. In 1776 Réveillon, went into partnership with a merchant called Delafosse who sold his papers from fashionable premises in the rue du Caroussel, opposite the Tuileries. Here clientele could could presumably view the ready made rolls or peruse sample books at leisure. Sold by Christies in 2003 for £1,195! All these papers were incredibly elaborate and, since they required as many blocks as colours, laboursome to produce. Madame de Genlis reports seeing a paper at Réveillon’s which require 80 blocks to complete; twenty or so was not at all unusual. Moccas Court in Herefordshire, boasts the only surviving example in England of Réveillon wallpaper panels still in their original setting. Frank Knight recently had the property on the market for a cool £5,250,000; it is now a luxury hotel. Although the fashion for flocks diminished, expensive fabrics, silk, velvet and tapestry, continued to be imitated throughout the century. 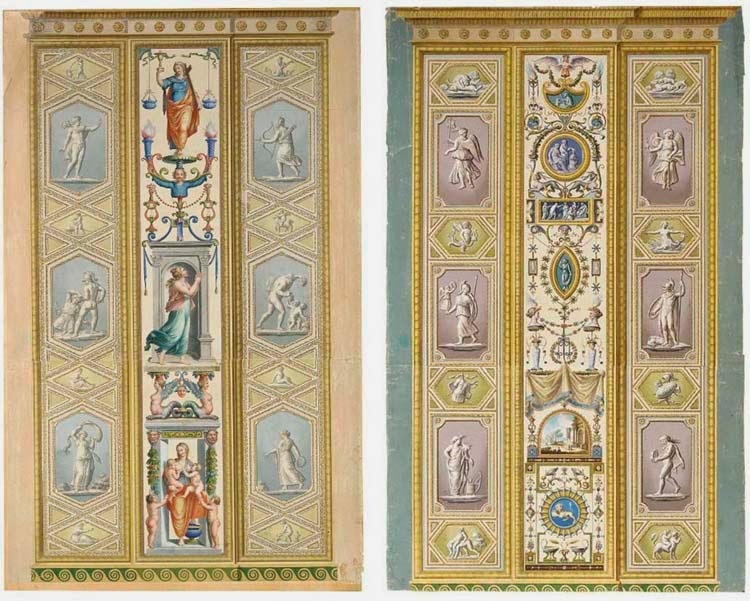 In 1770-90 Reveillon’s catalogues contain distemper-printed papers which are line-for-line replicas of known Lyons designs on crimson, blue or yellow grounds. Parallel white lines are overprinted on pale grey to suggest threads of brocade; and varnish has been added to the colour to create a silken sheen. 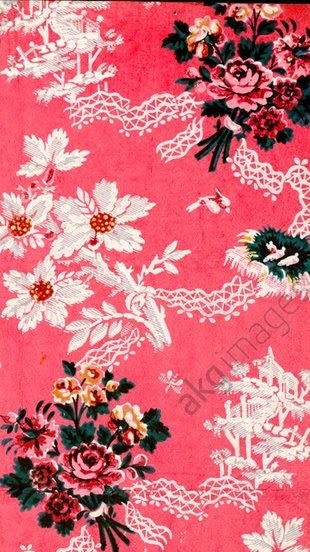 Floral patterns became a major motif from 1780s onwards. Before this date they occured mainly as part of feature panels and overdoors, but now they became fashionable for printed boarders or, in simpler form, for whole walls. Again. the characteristic designs are associated particularly with Réveillon. Later designs were lighter and more naturalistic, reflecting the change in fashion away from the imitation of heavy silk damask fabrics towards naturalism and domesticity. _________, "De la manufacture au mur", doctoral thesis, University of Lyons2, 2003.